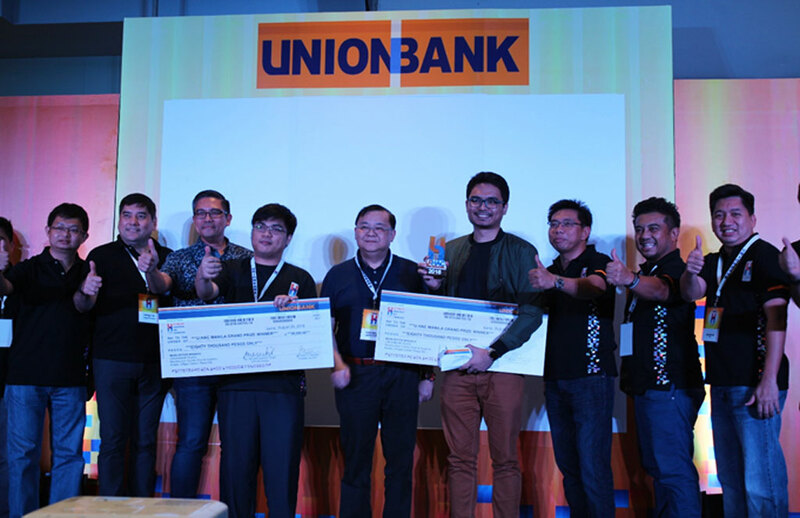 The winners of UnionBank’s Hackathon and Convention (U:HAC) in Manila showcased digital applications that focused on digital banking and banking in the future. U:HAC Manila Grand Prize winner Team White Cloak receiving their their two checks from UnionBank executives and U:HAC partners led by UnionBank President and COO Edwin Bautista, UnionBank SEVP Chief Technology and Operations Officer and Chief Transformation Officer Henry Aguda, UnionBank EVP Channel Management Center Head Dennis Matutina and Questronix Corp. Mike Dionisio. Grand prize winner Team White Cloak had invented an innovative application called uBank, which utilizes speech recognition and natural language processing to make telebanking more convenient, more cost-effective and more powerful. They won the doubled-up prize of P160,000 and P30,000 as Special Prize from IBM Bluemix plus Cloud Credit from IPC. Second place winner Team Chibot had presented their digital application Property View-R, which was a virtual reality listing of foreclosed properties where interested buyers easily get to view the property and speed up the procedure of processing the property’s selling through online customer information. For their impressive application, they received P60,000 as prize. Static CJ was named third place winner and received P40,000 as prize for their UnionBuddy mobile app, which uses cashless transaction services between small business owners and consumers. U:HAC Manila was held at SM Megamall Megatrade Hall 3 last August 27 & 28, 2016, which attracted a large crowd of participants comprising of students and professionals. All participants developed their innovative digital solutions and presented it to selected UnionBank executives and event partners who served as judges for the event. The students who participated came from UST, Ateneo, College of St. Benilde, Asia Pacific College, TIP, TUP, AMA University, FEU, PUP, UP Diliman, Philippine State College of Aeronotics, University of Makati, AIE Gapan, Batangas State University, among others. There were also participants who came from Cavite, Laguna, Samar, and Cebu. U:HAC provided the Bank the avenue to find creative minds who can develop technological solutions in a short period of time, hone these talents and provide them the support to advance their creativity. This is in pursuit to UnionBank’s promise of Smart Banking to its customers, where the Bank is continuously integrating digital innovations in its operations to transform itself as the leading Digital Bank in the Philippines.